Possession of marijuana without a medical marijuana card is still a crime in most Michigan cities. Beyond all the “what if?” and “what about?” questions you may have, if you have been charged with a possession offense, then there is no question about whether it’s a crime or not in the city in which your charge has been brought. Most of the cases I handle involve someone being pulled over by the police and then found to be in possession of a small amount of pot. Likewise, most people who wind up facing a marijuana possession charge did not have a valid medical marijuana card at the time of their arrest. In the interest of keeping this article short, I will skip the discussion of a medical marijuana card, or the few, but complicated defenses that surround one’s having had or otherwise being eligible for a card can bring, and look instead to how things play out for the average person charged with this offense who does not have a medical pot card. Any realistic examination of marijuana possession charges would be incomplete if we didn’t first admit the obvious: Pot cases are easy revenue for cities and townships. Societal attitudes are changing rather quickly, at least compared to the how marijuana was dealt with in the several decades preceding it’s legalization for medical purposes. Some municipalities have seen ballot proposals voted into law that either decriminalize or outright legalize possession of marijuana in small amounts for personal use. To be clear, though, and while there are some issues related to this beyond the scope of the present inquiry, there is no law that allows someone to drive around and smoke weed for any reason. Most of the cases I see involve otherwise law-abiding people getting caught, as a result of a traffic stop, with a small amount of marijuana that was to be used for recreational purposes. One of the primary and misplaced concerns some people have regarding a possession of marijuana charge is getting tossed in jail. I’ve never seen or heard of that happening in a simple possession case at any point in my 25-plus years as a lawyer. Perhaps the worst threat that comes along with a possession charge is that upon being convicted, the dreaded term “Drug Crime” is added to your driving record, and it can never be removed. 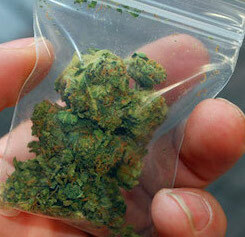 The law requires the suspension of a person’s driver’s license if he or she is convicted of possession of marijuana. The real bottom line to all of this is that you hire a lawyer precisely to protect you from stuff like this, and there are several ways I do that, even when the case against you is so rock solid that it’s indisputable. We’ve already established that everyone’s worst fear – going to jail – isn’t really on the menu. With that off the table, we can shift our inquiry to those things that can and are likely to happen to you. This isn’t very complicated, but I need the reader to stay with me for a few paragraphs because at first, it seems like it is. In any criminal case, the first order of business for the lawyer is to examine the evidence and how it was obtained in order to see if there is some way to “beat” the case, or get it thrown out of court. That can, although usually does not happen, so we’ll pass over any examination of those circumstances. In this sense, getting a case “knocked out” is always the exception and not the rule, so we’ll focus on the rule instead of the exception. The big thing about any kind of criminal charge, including possession of marijuana, is the conviction. Being convicted of something means it goes on your record. In Michigan, the way it works is that a conviction for possession of marijuana (or a conviction for possession of any other drug that does not result in a jail sentence) requires the suspension of your driver’s license. Even worse, the conviction also goes on your driving record, like I mentioned before, as a “Drug Crime.” Even if you get the conviction expunged from your criminal record years later, you cannot get the “Drug Crime” thing off of your driving record. Ever. That doesn’t help anyone’s career prospects. The goal then, is to avoid a conviction in the first place. Since we’ve already established that getting the case thrown out of court for faulty evidence is the exception and not the rule, then how, you might wonder, do we do that? To the experienced lawyer, this is as easy as giving away Halloween candy. Amongst other ways, there are 2 specific provisions in the law (known as “7411” and “HYTA“) allowing a person to go through a term of probation and come out of it without a conviction of any kind. We’ll forego any examination of those provisions here, as I have already done that in other, older articles on this blog and on my website. For now, we’ll look to results. Since the person is not formally “convicted” of the possession charge when a legal “tool” such as 7411 or HYTA is used, then nothing ever goes on his or her driving record, or criminal record, either. For the most part, a person cannot have been convicted of a prior drug crime, or previously had a drug charge deferred in the past in order to take advantage of this kind of deal, but even then, there are exceptions and workarounds that can save the day. The point to be made is that even when someone has been caught “red handed,” as the saying goes, a little good legal work can still entirely avoid a conviction. And make no mistake, most Judges are glad to be able to not have to blemish someone’s record with a drug conviction. To fully realize this break, however, you have to be able to complete a term of probation. The essence of probation is simple: Stay out of trouble. In most courts, the Judge will add a few things to that, like not smoking any weed (with a possible exception for those that have, or thereafter obtain a medical marijuana card) and periodically testing to show that you’re obeying the Judge’s order. In some courts, you may have to complete some kind of class, or do a little community service. While there are differences in the requirements of probation from court to court, the bottom line is that you stay out of trouble, do what the Judge requires, and don’t do what he she orders you not to do, and the whole case gets dismissed. No record and no license suspension: That’s a good deal. Over the years, and in the thousands of cases I’ve handled, I’ve seen certain patterns emerge. Many times, I get a call from the parent of a young man or young lady caught with marijuana. The parents are worried about the long-term consequences of a criminal and drug record. Another common situation involves someone for whom a conviction would adverse job consequences. If your employer ever reviews your criminal or driving record, or if you drive a company vehicle or even travel and rent one via a company expense account (meaning the insurance company will also review the driving record of everyone under its policies), then the importance of avoiding a conviction is obvious. Add to this a laundry list of occupation and employers that will not hire or keep someone with a drug crime on his or her record, and you pretty much have a snapshot of my client base. Whatever the situation, if you have been charged with a marijuana offense, I can help. As with anything, exercise your good consumer skills when you look to hire an attorney. Read what other lawyers have written, and then pick up the phone and find out how your questions are answered. Make sure you call my office, as well. Whether it’s to get my take on your situation, compare notes with something another lawyer has told you, or you’re just ready to come in and get started, we can be reached Monday through Friday, from 8:30 am to 5:00 pm, at 586-465-1980. We’re here, ready to help.